On Saturday, October 27, 2007, thousands demonstrated in major cities across the country against the U.S. war and occupation in Iraq. Calling for a swift end to American involvement in Iraq, people in the thousands rallied and marched from Seattle, San Francisco, Los Angeles on the West Coast – to Salt Lake City, Denver, Chattanooga and Jonesborough (where 400 marched on its depleted-uranium factory) in Tennessee, to Chicago, New Orleans, — and to Philadelphia, Rochester, New York City, Boston, Orlando and Ft. Lauderdale on the East Coast. Here in San Diego, the protest was officially postponed due to the fires but a few dozen demonstrated downtown nevertheless. Called on the fifth anniversary of the Senate’s authorization for the invasion of Iraq, the protests were primarily sponsored by the national coalition, United for Peace and Justice, of which our local Peace & Justice Coalition is a member. The protesters showed that thousands of Americans are still willing to show their opposition in the streets to the policies of the Bush administration. 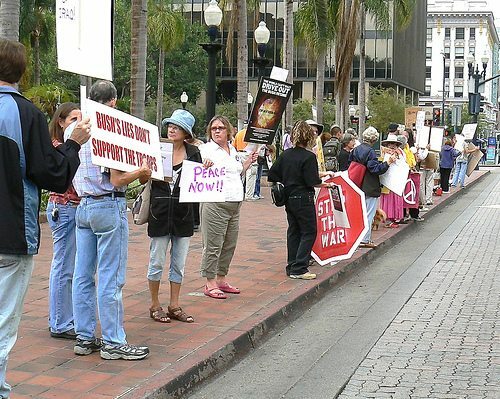 Saturday’s actions clearly demonstrated that there is still an anti-war movement alive in this country, and many of the speakers not only decried Bush’s policies, but also criticized the Democrats’ inability to derail the war machine. Mainstream news reports have come in stating that 3000 rallied and marched in Seattle; estimates as high as 30,000 demonstrated in San Francisco, — where thousands participated in a symbolic “die-in” on Market Street for three minutes; over 1000 appeared in Salt Lake City where Mayor Rocky Anderson spoke against the war; there were 5000 to 10,000 demonstrators in Chicago; 2000 plus in Philadelphia; and in New York City 45,000 protested in the rain. In Canada, hundreds demonstrated in Toronto, Ottawa, and Montreal against their government’s involvement in Afghanistan. Check out this article at the San Francisco Indybay.org website for details on the nationwide protest. I’m glad to see that their were people out there after all. Demonstrations and rallies are still important, they are a tactic, they shouldn’t be seen as the be all and end all of activism. Demos are away for new people to become involved, and learn about new things. I think a lot of times we tend to look at information we already agree with and use it to consolidate our thinking and opinions. If a call to rally and demonstrate against the war in Iraq is general and has very broad appeal then many people of differing opinions could show up. Once there they could learn why there should be a one state solution to the Palestinian question, or that it was wrong to attack Afghanistan as well as Iraq, etc. If people just stay home and “learn” from wrong liberals on KLSD and read selected clippings from corporate media at the Truthout site, they’ll be missing a lot that they could be hearing from real people at rallies, that they won’t hear anywhere else.